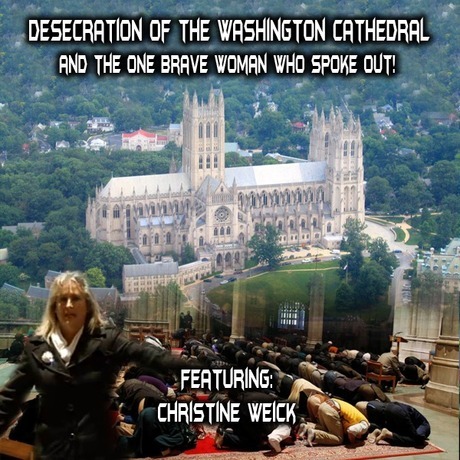 MESSIAH'S BRANCH Ministries and International Radio: Prophecy Hour - End Time Radio By Messiah's Branch - Desecration of the Washington Cathedral and the One Brave Woman Who Spoke Out! Prophecy Hour - End Time Radio By Messiah's Branch - Desecration of the Washington Cathedral and the One Brave Woman Who Spoke Out! Desecration of the Washington Cathedral and the One Brave Woman Who Spoke Out! The Washington Cathedral:Last Friday November 14th, 2014 allowed a Muslim prayer service to be held there inside….One Woman got inside and Spoke Out before the prayers were even started She Said! "Jesus Christ died on that cross over there. He is the reason why we are to worship only Him. Jesus Christ is our Lord and Savior. We have allowed you build mosques in this country. Why don't you worship in your mosques and leave our churches alone? We are a country founded on Christian principles." and I will tell you how to donate to her, as she lives in her car! The Cathedral Church of Saint Peter and Saint Paul in the City and Diocese of Washington, operated under the more familiar name of Washington National Cathedral, is a cathedral of the Episcopal Church located in Washington, D.C., the capital of the United States. It is the sixth-largest cathedral in the world, the second-largest in the United States, and the highest as well as the fourth-tallest structure in Washington, D.C. The cathedral is the seat of both the Presiding Bishop of the Episcopal Church, and the Bishop of the Diocese of Washington. say, do, or believe. It is up to you to pray and sort it out!"